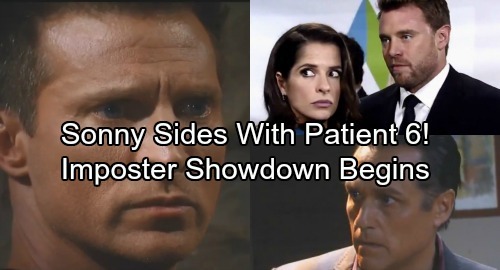 General Hospital (GH) spoilers tease that Patient Six (Steve Burton) will do everything in his power to convince Sonny (Maurice Benard) he’s the real deal. He’ll explain that he’s been held hostage at a clinic for five years, but Sonny will bring up current Jason (Billy Miller). They’ll both be pretty confused about how this case of mistaken identity came about. Nevertheless, Patient Six will rattle off more info that shows he could be the true Jason Morgan. General Hospital spoilers say Sonny will just have to go with his instincts on this. He’ll probably give Patient Six the benefit of the doubt and agree to look into this for him. It appears they’ll keep their reconnection a secret for now. Of course, it’ll be hard to keep Carly’s (Laura Wright) curiosity under control. GH fans can expect total chaos on Friday’s new GH episode, October 27. After Dr. Klein’s (Gene Farber) thugs crash the launch party, Sam (Kelly Monaco) will be taken hostage and Carly (Laura Wright) will be held at gunpoint. Naturally, Carly’s going to wonder what’s going on after all the mayhem. General Hospital spoilers state that she’ll seek answers on October 30. Meanwhile, Jason (Billy Miller) will try to track down Sonny. There’s a good chance Sonny will be avoiding Jason thanks to his chat with Patient Six. Sonny has no idea that Jason has a twin, so it makes sense that he’d side with Burton’s character. After all, he looks just like the old Jason. How will Sonny react when current Jason reaches out? He may try to play it cool and figure out what’s up with this guy. Sonny won’t know if he can trust current Jason in light of the recent developments. General Hospital spoilers state that Sonny and Jason’s loved ones will slowly be brought in the loop. As more characters find out there are two Jasons in town, things could take an interesting turn. People will undoubtedly choose sides and wonder who’s who. It looks like a shocking showdown could be brewing. Current Jason may be the one under the most suspicion pretty soon. Again, Burton has his appearance on his side. Sonny and the others might hurl imposter accusations at current Jason. They may believe they’ve been duped. Once she’s rescued, Sam will likely intervene and insist that they don’t have all the facts. She’s right about that. Franco (Roger Howarth) will eventually spill what he knows, but there’ll still be drama to work through. Learning true Jason’s identity could be tougher than any of them thought! How will current Jason handle the suspicions that are headed his way? Will Sam be the only one who believes in him? Will anything change if Burton is revealed as the real Jason? We’ll give you updates as other GH news comes in. Stay tuned to the ABC soap and don’t forget to check CDL often for the latest General Hospital spoilers, updates and news.